To celebrate the 40th anniversary of the Labour Party in Brussels, Brussels Labour produced a commemorative book looking back at key events in the branch’s history. On 16 October, Martin Schulz, the President of the European Parliament, delivered the 2013 John Fitzmaurice memorial lecture. Click here to see the full text of the speech, or you can see photos from the event below. 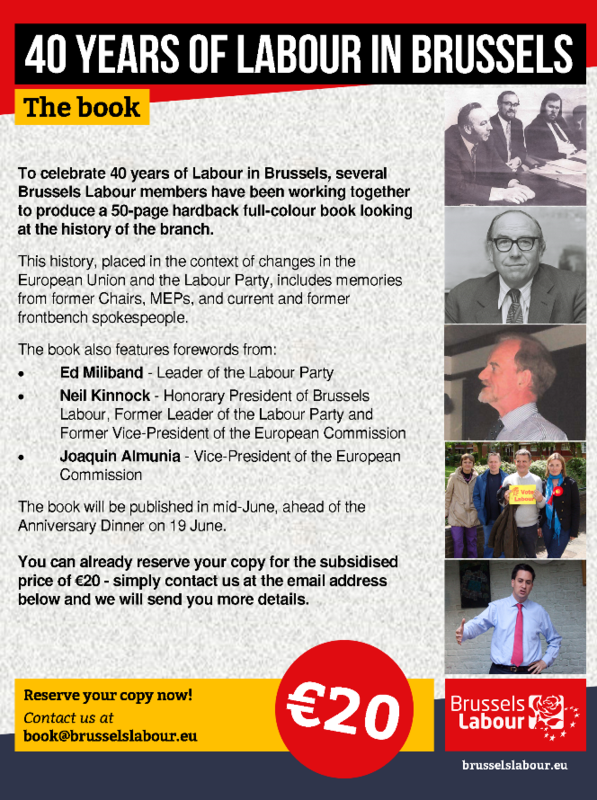 40 Years of Brussels Labour – get the book! Reserve your place now for the anniversary dinner! 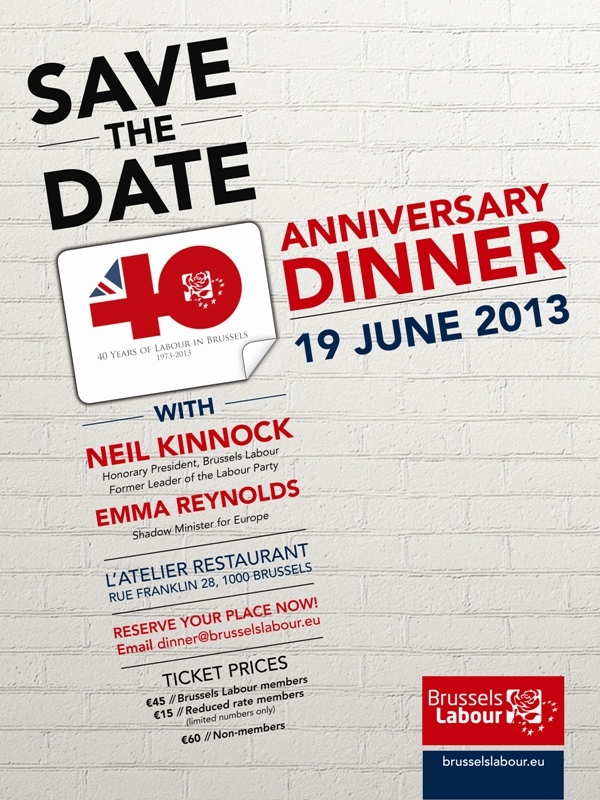 The dinner will be addressed by Neil Kinnock, Honorary President of Brussels Labour, former leader of the Labour Party, and former Vice-President of the European Commission, and by Emma Reynolds MP, the Shadow Europe Minister. The dinner will be held in the Restaurant L’Atelier Européen, Rue Franklin 28, 1000 Brussels. Tickets are €45 for Brussels Labour members, €15 for members on a reduced rate (limited places available) and €60 for non-members. To book your place or for more details please, contact us at dinner@brusselslabour.eu. Guest blog by Julian Priestley: Britain and Europe – the last rites? This ‘Tribune’ article was written for Notre Europe – Jacques Delors Institute. In Britain when a family decides not to have a party to mark some calendar event it is usually said, ‘We’re having a quiet New Year’ or ‘I’m having a quiet birthday.’ The celebration of Britain’s fortieth anniversary of its membership of the European Community will be a particularly muted affair. Any boisterous carousing is more likely to come from the other side. Britain’s dedicated anti-Europeans will congratulate themselves on the UK’s progressive disengagement from the European project; the ‘veto’ of the Fiscal Pact; the negative position on the EU budget voted in the House of Commons (thanks in part to an act of crass opportunism by Labour MPs); growing public support for a referendum; the inroads now being made by UKIP in national as well as European elections, the toil in Whitehall drawing up an inventory of competences to be repatriated to Britain, and the first opinion polls showing a strong majority for outright withdrawal. All the while the daily drip feed of anti-European bile from most of the media continues. There are also worrying but understandable signs that the rising optimism of the anti-Europeans is mirrored by the frustration and annoyance of the UK’s friends and partners which begin to resemble the World War I recruiting song, “We don’t want to lose you but we think you ought to go”. As the UK government tries to appease anti-Europeans at home through a policy of surly non-cooperation it alienates even members of what used to be an almost automatic support group of countries from Northern and Eastern Europe. Patience with Britain is being exhausted, and resistance to any future demands for special treatment growing. Read the rest of the article by downloading the PDF here. Brussels Labour’s 40th anniversary – help us celebrate! 2013 marks the fortieth year of the UK’s membership of the EU, and it marks 40 years of Brussels Labour. At the start of 1973, a group of enthusiasts formed what was then called the British Labour Group (BLG) to bring together Labour Party members and supporters in Brussels. The driving force was Alan Forrest (at the time an official at the ICFTU), who became the first Chair. Right from the start, the BLG attracted high level speakers: on 29 March 1973, George Thomson, the first British Labour Commissioner, spoke on ‘Socialism, Internationalism and the Common Market’. And over the years, the Party headquarters came to acknowledge the value of Brussels Labour (though it took some twenty-five years of campaigning to get formal recognition). a gala dinner (as we did for the 25th and the 30th anniversaries). We will associate the Party, including our MEPs, in these activities, as well as other sister parties notably from the other countries – Ireland and Denmark – which joined the EU in 1973.
to turn all this into an online presentation, maybe also in printed form, linked to narrative about history of BL and also about development of UK and/or Labour Party attitude to the EU. We will report regularly to branch meetings and in Germinal on the preparations for Brussels Labour’s 40th.